TrustPort USB Antivirus is a powerful security software that is designed for secure data transfer on USB memory media. The TrustPort USB Antivirus provides reliable protection for USB flash drives against viruses and spyware. In addition, the TrustPort USB Anti-Virus also comes with on-access protection feature that able to scan drives and folders to prevent viruses and spyware from being copied to the flash drive. Furthermore, the software also provides an archive encryption feature that protects important data by storing them in encrypted archives. Moreover, the TrustPort USB Antivirus has added tons of features such as Conventional Scanning, Heuristic Analysis, sandbox test or automatic scanning of newly connected drives, and Data Shredder module that enable shredding of already unused private files. The latest version of TrustPort USB Antivirus is of version TrustPort USB Antivirus 2010. For people who do not mind using older version of TrustPort USB Antivirus 2009, TrustPort is giving away free license for TrustPort USB Antivirus 2009 with six months free fully functional license key, with no restriction nor locked features. To grab the free full version TrustPort USB Antivirus, just head to the following URL, and fill in the form by entering your email address with three valid email addresses of your family/friends/associates. Download the TrustPort USB Antivirus by using the direct download here: TrustPort_U3_Antivirus_2009_EN.exe, and run the setup installer of TrustPort USB Antivirus to install the software. 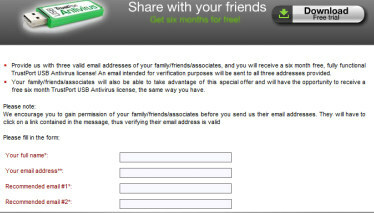 Note: Users need to provide three valid email addresses of your family/friends/associates. Besides, user will only receive the license key when they click the conformation link in the email sent by TrustPort.